It is once again time for Rhody Days in Florence, Oregon, on the coast! Starting Friday, May 18 through Sunday, May 20, all the usual, fun activities will take place and maybe a few new ones, too. There will be hundreds, if not thousands, of visitors in town for a day or the weekend as this is a most popular coast event. Come join in the fun. Our post from 2015 below will let you in on many of the activities you can enjoy! Check out the new photo added in 2018 of the Budweiser Clydesdales! It’s Rhody Days weekend again!!! 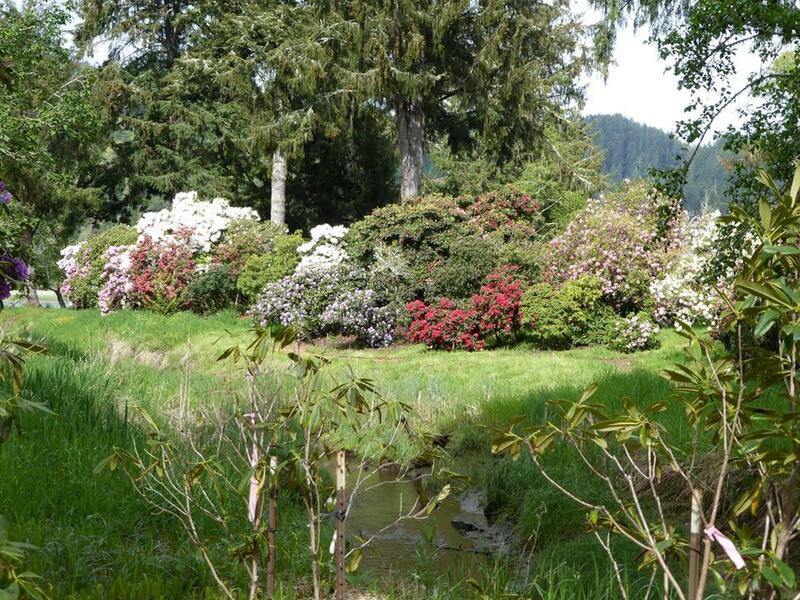 A short 45-minute drive from Umpqua River Haven, Florence, OR is home to this festival every year mid-May. The above photo was taken in our park, Umpqua River Haven. 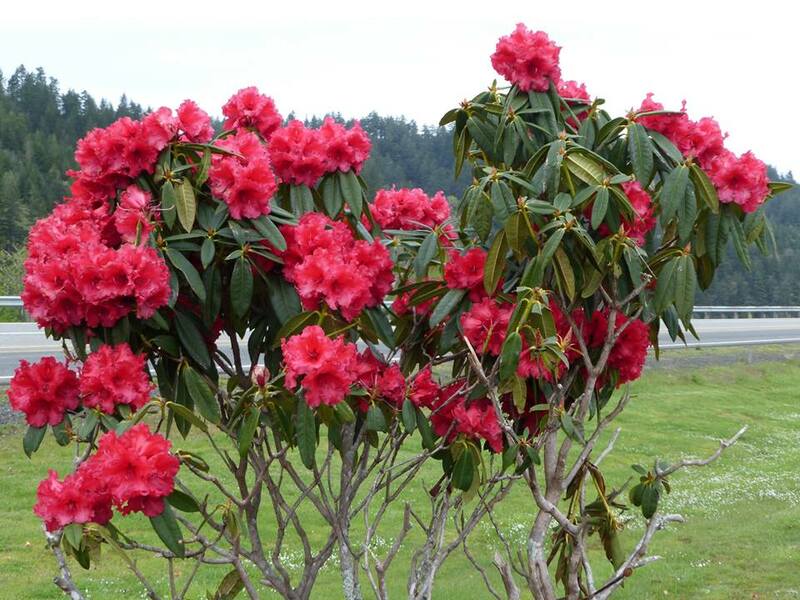 There are many varieties of “Rhodies” and Oregon has them all. Wild ones are usually pink and do grow wild along the coast road near Florence. But you will find them planted everywhere. When we first came to Oregon and visited the coast, we didn’t know what those beautiful flowers were. But we soon discovered they were wild “Rhodies” on the coast road just south of Windy Bay. 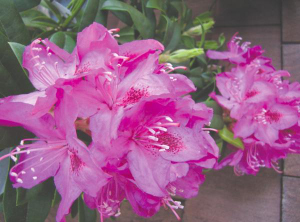 At the Florence Events Center, many Florence gardeners display in the competition the Rhododendrons they have grown. The usual award categories are in evidence and it is major eye candy to visit during the festival competition. Florence is a busy place during Rhody Days and Old Town on the Siuslaw River is host to a variety of visitors. Not to be missed are the Rhody Run Bikers. 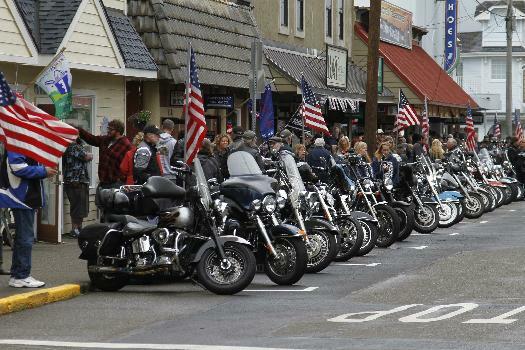 Bikers from all over the country arrive and park their Harley’s on the streets of Old Town. It’s quite a sight! In 2015, Budweiser brought their Clydesdales to the Rhody Festival. They were housed in the middle of town in a big tent-barn. They are magnificent to see up close and in person and having them there was a real treat for everyone. There are a variety of events and activities including the parade, street vendor fair, 5K run, carnival and more. You can meet Queen Rhododendra and King of the Coast. Our personal favorite event is the Classic Car Show. 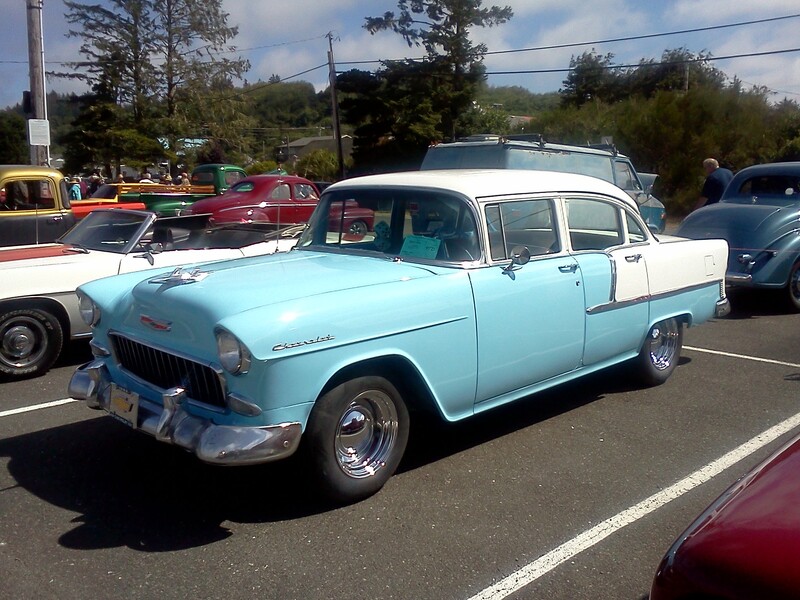 Yummy cars from all over are parked in the big parking lot on Highway 101 in the center of town. Our friend, Myron Aho, started the Rhody Days Car Show and it has grown big over the years. Bring your Classic Car and join in the fun! Come stay with us at Umpqua River Haven away from the crowds (hard to get a room on the coast at this time anyway) and enjoy Rhody Days in Florence the weekend of May 18 – 20! If you miss this particular weekend, come anyway. The Rhodys are still in bloom and the coast is beautiful! Rhody’s blooming all over! So lovely. We have pink and white ones here in the complex, none in front of #27 though.